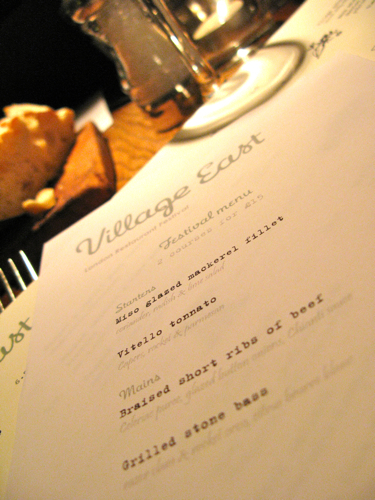 Friday night at at Village East feels much more New York City’s Meatpacking district than neighbourhood Bermondsey eatery. Sprawled over multiple levels, there is heaps of space amongst the bare-brick walls and raw wooden pillars of this converted South-East London warehouse. There’s a great vibe emanating through out the place plus a bar that knows how to serve up a mean cocktail. It’s that time of the year that is London Restaurant festival week. Hence I’m finding it difficult to resist the value of the 2-course £15 set menu on offer.The food, though not particularly mindblowing was very decent in most departments. Our starter of Miso-glazed mackerel fillets was as you would expect -a good balance of rich, savoury and sweet helped along by a fresh and zingy radish salad to cut through the bold flavours. 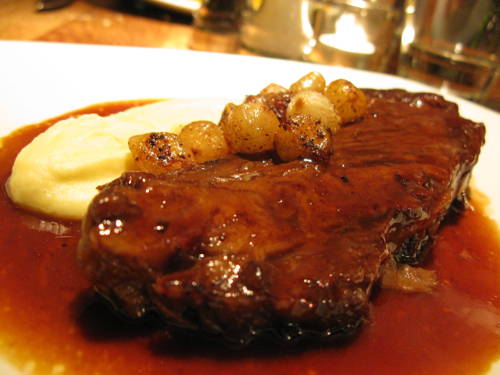 Braised Short-rib of Beef was the star of the evening. So tender from slow roasting that you could flake it with a fork, it melted away in the mouth like velvet, releasing a barrage of beefy flavour, followed by the wonderful savoury finish from the Chianti sauce. A dish I would gladly pay the full something-north-of-£15-quid-price-tag for. 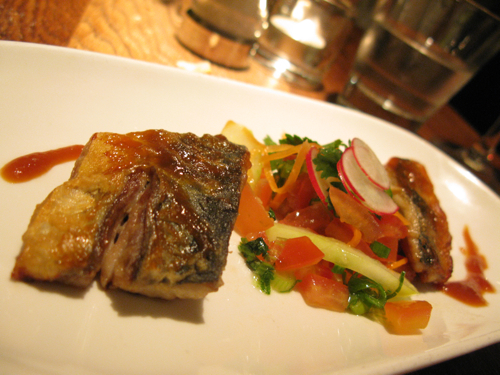 Jo’s Grilled Stone bass however was one that sounded a lot more exciting in writing than on the palate. The beurre blanc was a little watery could have done with more citrus kick. 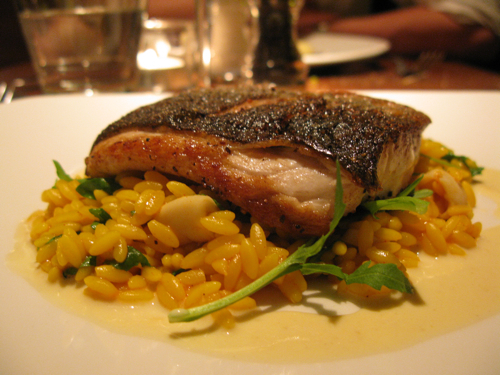 But other-wise, a well-cooked piece of fish on top of seafood paella rice. I wouldn’t count on the Desserts to end your night on a high though (head to one of the 2 bars instead). 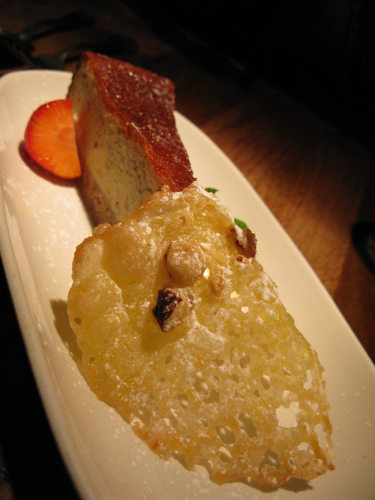 The Hazelnut and Ricotta Cheesecake we ordered was average at best. The flavours pleasant, but the texture more pastey than cake-like. At a place like Village East though, its a lot less about the food, but more about the buzz and ambiance. I’ve always been partial to being north of the Thames, but the likes of Zucca and Village East give a few more reasons to make the trek South of the river. Nice write up, looks like a good place to try. Thanks. 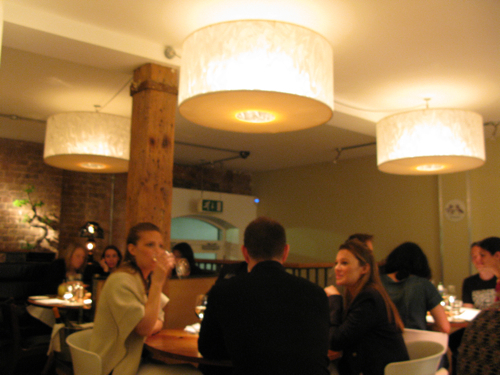 Tx for stopping by – Food is decent, but its the buzz of the place that really stands out. Particularly good for Friday Night drinks if you are ever in the area. I think the best part about it is that its busy without being overcrowded to the extent you have to queue or squeeze into the place like sardines! I had bad food there recently… love the cocktails and the bar but food is a waste of calories and money I think… especially with Zucca just across the street. Ute@hungryinLondon: You definitely hv a pt – Zucca for dinner followed by Village East for Drinks is definitely the killer combo. Food wasn’t terrible for us tho, but there might have been an element of dressing to impress for London Restaurant festival week. Tx for stopping by.